Lampotang S, Good ML, Gravenstein JS, Carovano RG. US Patent 5,391,081 issued February 21, 1995: Method and apparatus for simulating neuromuscular stimulation during medical surgery. Lampotang S, van Meurs WL, Good ML, Gravenstein JS, Carovano RG. US Patent 5,584,701 issued December 17, 1996: Self regulating lung for simulated medical procedures. Lampotang S, van Meurs WL, Good ML, Gravenstein JS, Carovano RG. US Patent 5,769,641, issued June 23, 1998. Apparatus for and method of synchronizing cardiac rhythm related events. Lampotang S, van Meurs WL, Good ML, Gravenstein JS, Carovano RG. US Patent 5,772,442, issued June 30, 1998. An apparatus for and method of simulating bronchial resistance or dilation. Lampotang S, van Meurs WL, Good ML, Gravenstein JS, Carovano RG. US Patent 5,772,443, issued June 30, 1998. An apparatus and method of detecting and identifying a drug. Lampotang S, van Meurs WL, Good ML, Gravenstein JS, Carovano RG. US Patent 5,779,484, issued July 14, 1998. Apparatus and method of simulating breathing sounds. Lampotang S, van Meurs WL, Good ML, Gravenstein JS, Carovano RG. US Patent 5,868,579, issued February 9, 1999. Apparatus and method for simulating lung sounds in a patient simulator. Lampotang S, van Meurs WL, Good ML, Gravenstein JS, Carovano RG. US Patent 5,882,207, issued March 16, 1999. 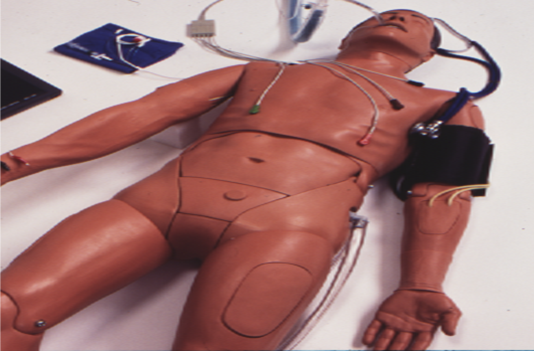 An apparatus and method for quantifying fluid delivered to a patient simulator. Lampotang S, van Meurs WL, Good ML, Gravenstein JS, Carovano RG. US Patent 5,890,908, issued April 6, 1999.Apparatus for and method of simulating the injection and volatilizing of a volatile drug. Lampotang S, van Meurs WL, Good ML, Gravenstein JS, Carovano RG. US Patent 5,941,710, issued August 24, 1999. Apparatus and method of simulating the determination of continuous blood gases in a patient simulator.